Getting organized is a classic resolution for the New Year, which is right around the corner! Closets, in particular, are spaces we tend to cram full of belongings throughout the seasons. After all, they are the perfect place to hide away unsightly clutter. 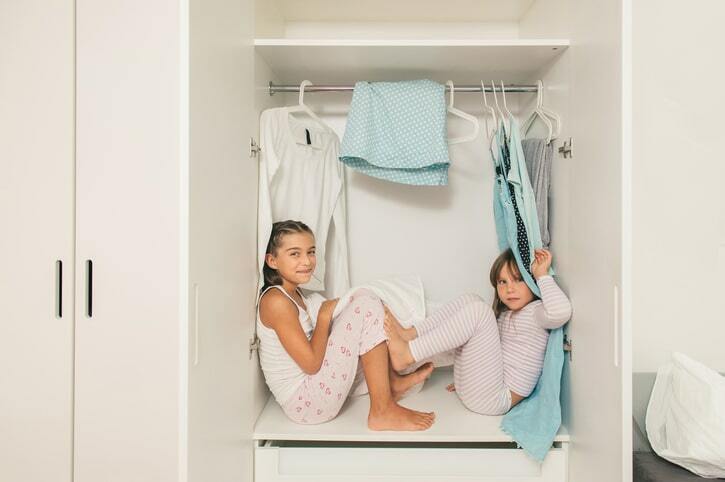 At More Space Place Sarasota, we think your closet is an especially easy starting point for your more organized year! 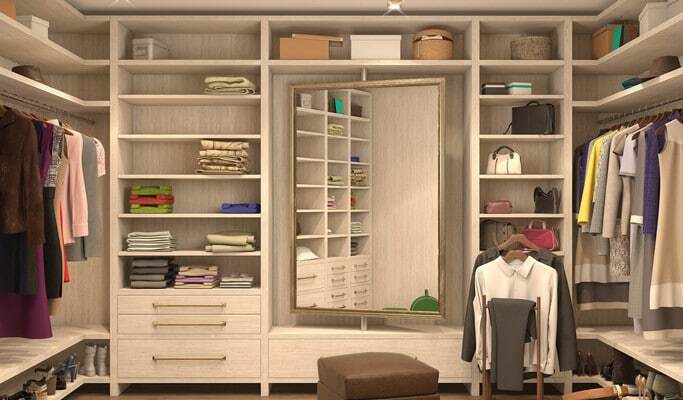 If you find your closet filled to the brim and seemingly impossible to sift through, a custom closet might help you stay sorted beyond your January 1st decluttering spree. 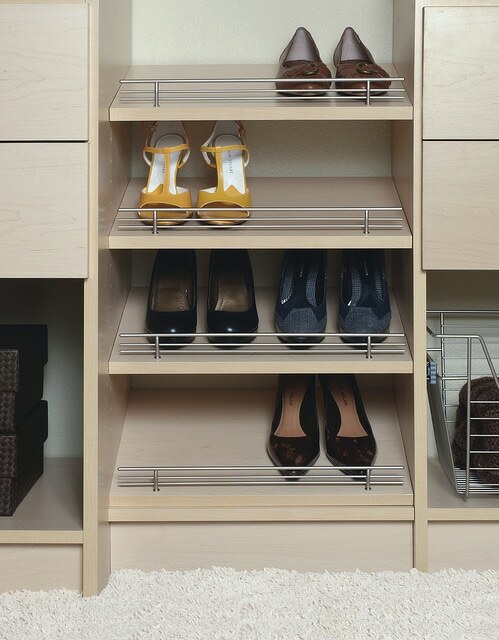 Below, we’ve highlighted some of the ways a custom closet can help you stay organized. Simply not having the space to organize your belongings can be a frustrating experience. When you don’t have the means to be organized, it’s entirely understandable why clutter may get a little out of hand. 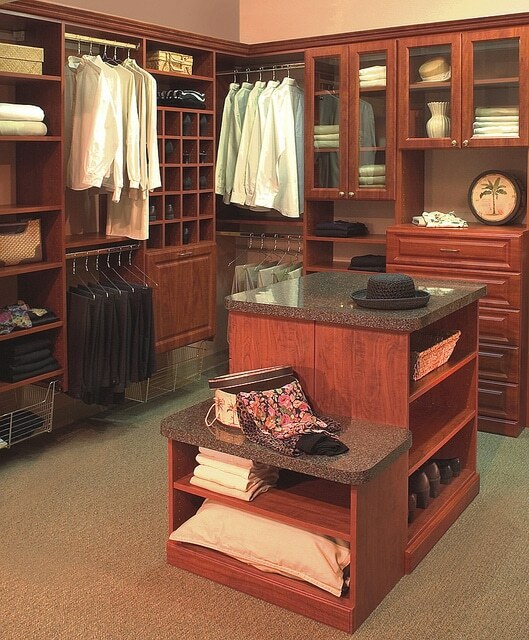 A custom closet transforms an ordinary four-walled closet into an expansive, efficient, storage solution. Now with the right tools, organizing will be a breeze! Instead of searching through a pile of shoes for your favorite pair, all of your shoes could be openly displayed on a shoe rack. Rather than rushing in the morning to assemble a put-together outfit, you can quickly glance through a closet customized for your lifestyle and wardrobe. We love the idea of laying outfits ahead of time on a bench or hanging pieces together on a metal rod. Also, never fiddle with a tangled necklace again when you store them in jewelry drawers. With these timesavers, you can spend more time on your other resolutions, like going for a run or reading a new book! With extra hanging rods, more shelves, and more drawers, you simply have more storage to put things away. A great organization tip is to store away your seasonal clothing. The holidays won’t be around for another year, so your holiday sweaters don’t need to take up extra space! Instead, make room for the new items you are bound to gather over the next year. 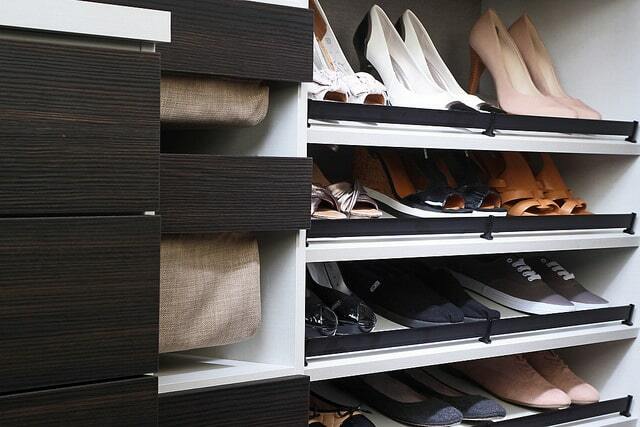 Surprisingly, your floor is another space guaranteed to benefit from a custom closet! We all have that family member who tends to toss dirty clothes on the ground. 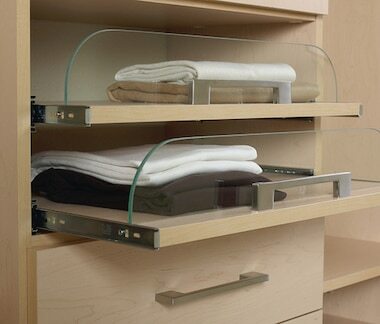 With a custom closet that has a built-in space for laundry bins, keeping dirty clothes off the ground is even easier. 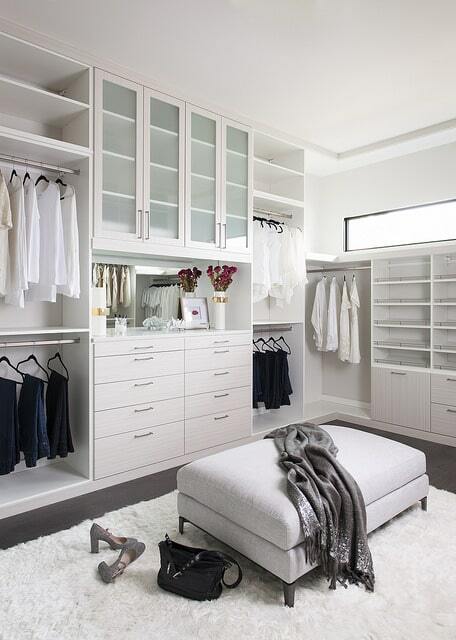 A custom closet is the perfect way to make your space work for you and your lifestyle in the New Year. 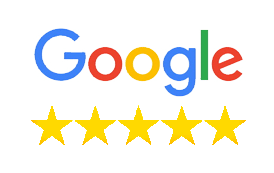 Contact our experts at More Space Place of Sarasota, Bradenton, and Port Charlotte today for a free in-home estimate! Not only can a beautiful custom closet make your life easier, it can also be just the feature that helps you sell your home fast when the time comes. Think back to when you were looking for a new home and how closet space fit into your home-buying decision. 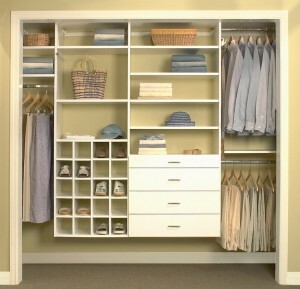 Small, messy, disorganized closets often suggest to potential buyers that your home might not have enough closet space. It might be time to consider customizing your closets. More Space Place of Sarasota, Bradenton, and Port Charlotte is here to help! If you’ve ever thought about custom closets, maybe you’re familiar with features like shoe cubbies, tie racks, and adjustable shelving systems. Customizing your storage space ensures it works perfectly for your needs and your individual lifestyle. We’re always seeking out new designs and features to help make your life easier. Hidden safes can be added to your custom closet design to provide security for your valuables in an unobtrusive way. 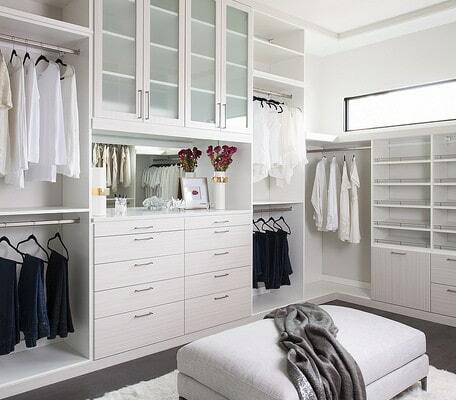 Jewelry cabinets and drawers are an excellent addition to a custom closet system. 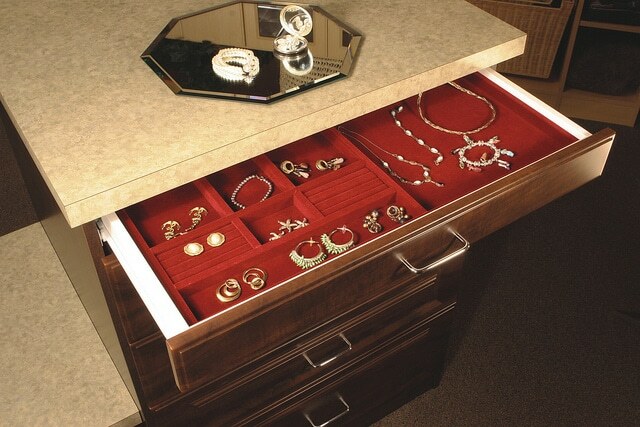 Whether you need to organize family heirlooms or costume jewelry, these handy features keep your jewelry organized, secure, and easy to find. Flip top benches with storage compartments built in give you a comfortable spot to put your shoes on while providing extra storage space you didn’t know you needed. Lighting is essential when it comes to your custom closet. One of our More Space Place custom closet designers can help you determine exactly where light is needed and how much you should include. Between built-in LEDs, tracked lighting, recessed fixtures, or a lighted mirror at a vanity, there are many options. Clothing rods made of wood or metal are making a comeback as opposed to wire rods. This is, of course, a personal choice, and either style can work well. Talk to your custom closet consultant about the right choice for you. Center islands are great for being able to place an outfit to preview how it would look before getting dressed. If you have a walk-in closet, it can be designed around a center island that includes additional storage in the form of shelves or drawers. The average closet often turns into a dumping ground to hide and collect clutter from the rest of the house. However, if a potential homebuyer were to see a closet in this state, they might get the idea that the home doesn’t have sufficient closet space. 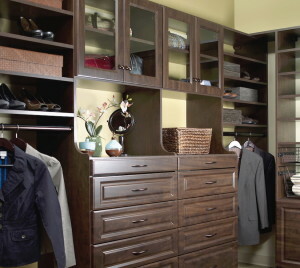 A custom closet gives the impression that there is enough–or even extra–storage space in a home. They’ll feel confident that they’ll be able to store everything they need comfortably in an attractive way. Consider having your closet professionally customized. 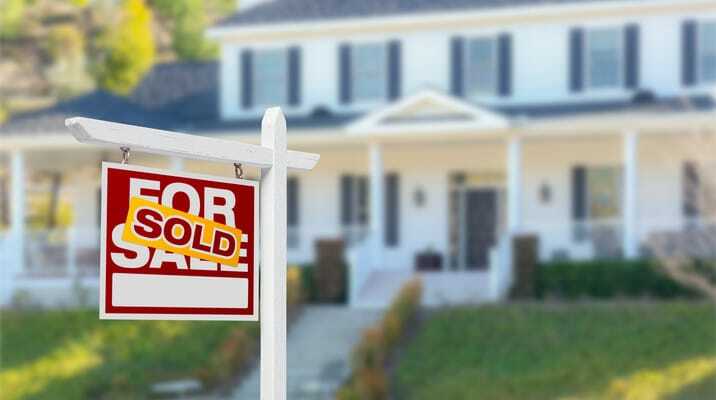 Not only will you get to enjoy the many benefits of it, but it will also add value to your home if you ever plan to sell. 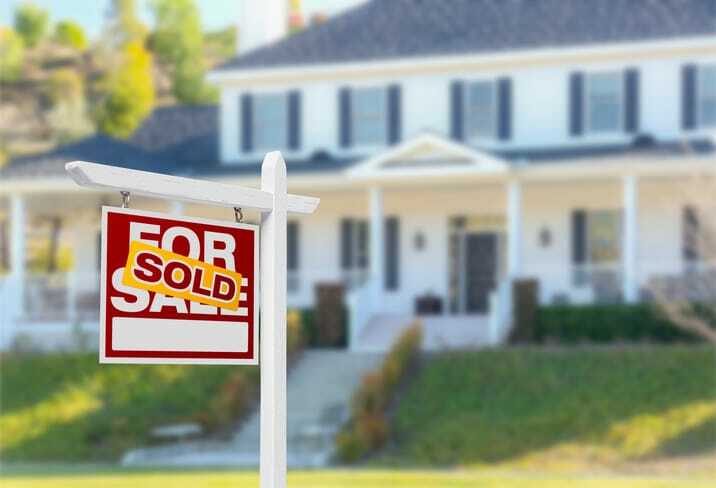 Contact More Space Place of Sarasota, Bradenton, and Port Charlotte today for a free in-home estimate! If you’ve been struggling with closet clutter, it may be affecting your life in other ways you haven’t realized. Clutter and disorganization at home can seep over into other areas of your life. Sifting through chaotic piles of clothes and shoes can start your day off on the wrong foot. A beautifully organized closet not only looks great, but it can also make your life feel simpler and more put together. To accomplish this, consider doing a complete closet makeover. Here we’ll look at how to turn your Sarasota closet into a customized space that perfectly suits your storage needs. The first step in starting your closet makeover is to clean out your entire closet. You’ll likely discover unwanted and unused items that are only taking up space. Go through all your clothes, shoes, and accessories and separate the pieces you can donate to a local Sarasota charity/donation center and the things you need to just throw out. Once you’ve narrowed down your things to what you want to keep, you can start planning how you’ll organize them to maximize efficiency. Now that you know exactly what you’ll need to store, you can start planning how you’ll store it. 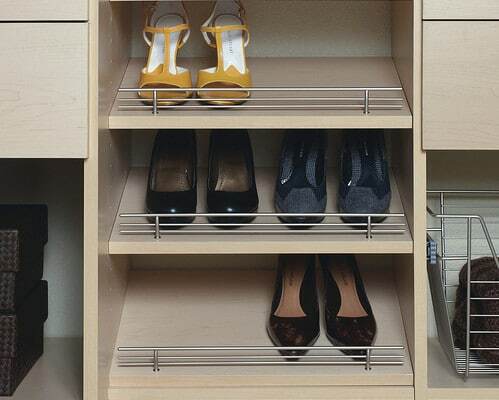 If you have a lot of shoes, you’ll want to make sure you plan for ample shoe storage. If you have things to hang, such as bags, jewelry, and belts, you can plan for sufficient hooks and hangers. 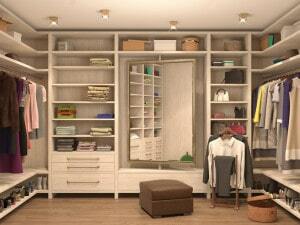 Designing a custom closet allows you to exercise your creativity and create a customized space just for you. Everyone has different lifestyles that warrant different storage needs. That’s why the “one size fits all” method isn’t the best solution when it comes to closet storage. Once you have an idea of what you want the final product of your closet makeover to look like, call your local experts at More Space Place Sarasota for professional assistance. Our seasoned design and storage experts will work with you to achieve the perfect custom closet solution, starting with a free in-home consultation. We design and build all of our custom closet components in our own factories, and we offer a variety of furniture colors and finishes to allow you to match your desired style. Give us a call today!